Yongin, once regarded as a commuter town in Gyeonggi Province, is now developing into a business-centered metropolis equipped with a growth engine as it amasses infrastructure befitting a city of more than 1 million residents. The development has been underway since Mayor Jung Chan-min took office nine months ago. 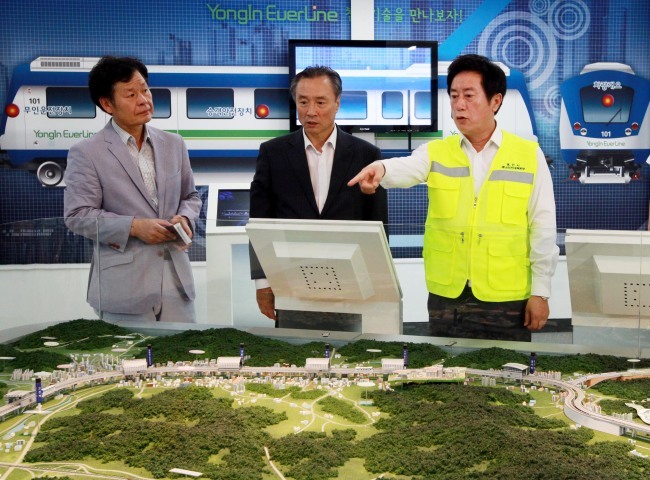 The city is setting up several industrial complex centers including the Yongin Techno Valley currently under construction, and the once-dormant light rail Everline is currently used by over 30,000 passengers daily. Yongin is also promoting its image as a welfare-friendly city, with events on prenatal care and soccer teams for middle-aged women. Yongin City Hall, once criticized as overly luxurious, has also become an accommodating area for its residents. Yongin has hosted industrial complexes to house companies with high value and technology. Yongin Techno Valley, the star building of the lot, has attracted much interest from the business community. Although it is still under construction, it has completed its application process for bringing in 257 companies to the building. The 1.02-square-kilometer Yongin Techno Valley, to be completed in 2018, is expected to create jobs for about 10,000 people, bringing in economic benefits of 890 billion won ($814 million). Mayor Jung has so far set up 10 general industrial complexes in accordance with his campaign pledge. He plans to expand the project by building more complexes in the city by 2017. The 20 industrial complexes are expected to create jobs for 10,000 people and bring 10 billion won annually in tax revenues. He is also promoting plans to build technological centers, such as ones for green technology, biological research and R&D for new materials. A thriving public transit is essential for a large city. Everline, the major light rail line of Yongin, opened two years ago, but it had been long regarded as a public nuisance with fewer than 10,000 users per day. The mayor sought to vitalize the light rail line by organizing a citizens’ committee as well as personally commuting to work via the train. After implementing the Metropolitan Unity Fare system in September last year, the number of passengers drastically increased. After one month, over 20,000 passengers on average used the light rail daily, and the number reached an average of 30,000 passengers last month. Expecting the number of passengers to continue increasing in the near future, Jung is also pushing for a Gwangju-Everland double track railway, setting up a promotion committee for the proposal in January. He stated that the Everline also needs to be connected with the train lines in order to further increase the number of users. Yongin is also promoting citizen welfare, especially for women and children. The city has set up a “Jummarella soccer team” (a portmanteau of “ajumma,” a middle-aged woman, and “Cinderella”) for middle-aged women. There are currently 16 Jummarella soccer teams across different towns, which is expected to expand to 31 by the end of April. There are also plans to hold a Yongin City Jummarella Soccer Festival in the latter half of this year to promote female empowerment. Yongin is also pushing prenatal care as one of the city’s brand and core identities after the female confucian scholar Lee Sajudang (1739-1821), who lived in Yongin and published “Taegyosingi,” a book on the belief and practices of prenatal care in the late Joseon Dynasty. The city plans to create cultural content and industries centered on prenatal care, and is holding a Prenatal Festival on May 23 for pregnant women, newlyweds and their family members. There are also plans to create a 7-kilometer “prenatal care forest path” by 2016. In addition to city-wide welfare plans, Yongin plans to continue developing its housing administration as the city won first prize in a competition of housing policy in Gyeonggi Province in 2014. In order to keep up the achievement, the city has implemented the “Eutteum Apartment” policy in January, which plans to enforce transparency in apartment management, fortify neighborhood communities and provide a comfortable residential environment by carrying out related services. Yongin is also laying the foundation to become a residential tourist city in order to develop tourism as one of its economic forces, as it already hosts a number of top tourist attractions in South Korea. Several examples include the Korean Folk Village, amusement park Everland, Ho-am Art Museum and the Nam-june Paik Art Center. It is also home to ancient structures such as the Simgokseowon Confucian Academy and Stele for State Preceptor Hyeono at Seobongsa Temple. The city also hosts nature-themed areas such as Yongin Agricultural Theme Park, Yongin Natural Recreation Forest and Hantaek Botanical Garden, and educational centers such as Gyeonggi Provincial Museum and Gyeonggi Children’s Museum. Yongin, a city boasting 600 years of history and culture, is one of the central cities in the metropolitan area and is paving the way to become a city focused on development and welfare of its citizens.